The new winter group exhibition at The Headlands presents an exploration of ambivalence. The show, titled (Im)materiel, showcases 18 California artists realizing these intangibles in sculptures, stills and videos. Guest curator Kevin B. Chen selected art works that survey the ambivalent borderlines between the known and the unknown, the tangible and the intangible, the terrestrial and the extramundane. The works relate to a wide range of subjects, from the nature of basic materials to object and landscape and to abstract concepts like documentation, ritual and memory. The show begins with the investigation of material itself. Caroline Hayes Charouk uses her sculptures to investigate our perception of materials’ qualities. She creates large soft objects of magnified geological geometries, changing their meaning as they lose their original qualities of hardness and heaviness. 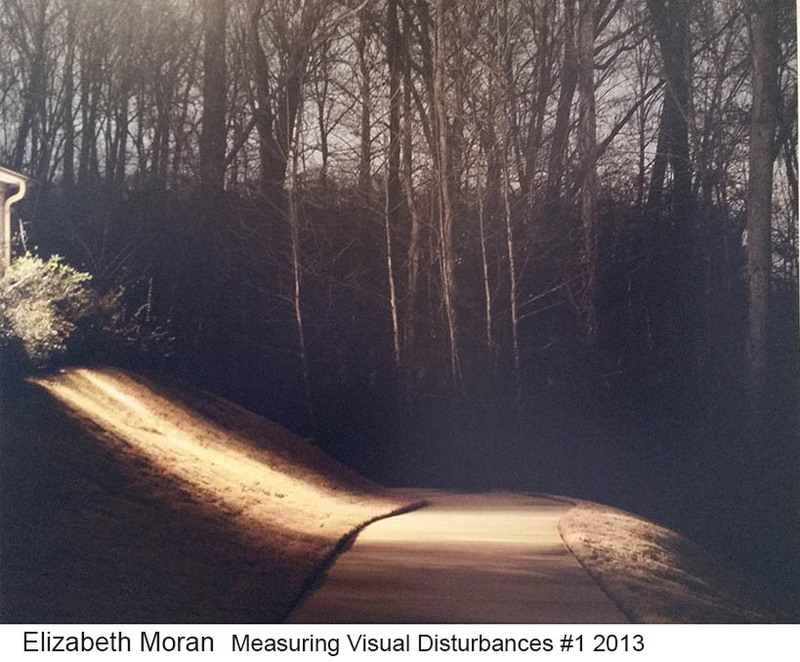 Other artists re-contextualize mundane materials and transform them into new states at the moment of exhibition. Jennifer Brandon throws plastic bags into the air and photographs them as they parachute down. At the moment of flight, she lends the bags a temporary existence apart from their everyday functionality. Randy Colosky uses construction materials in his work. Referring to his past as a fabricator and building designer, he employs formal geometric and mathematical language to transform a set of steel pipes into visual poetics. Welded on their long sides, the openings create a new curved surface of abstracted circular units. Chris Thorson makes everyday objects such as Trompe-l’œil fruits from paper-mache. 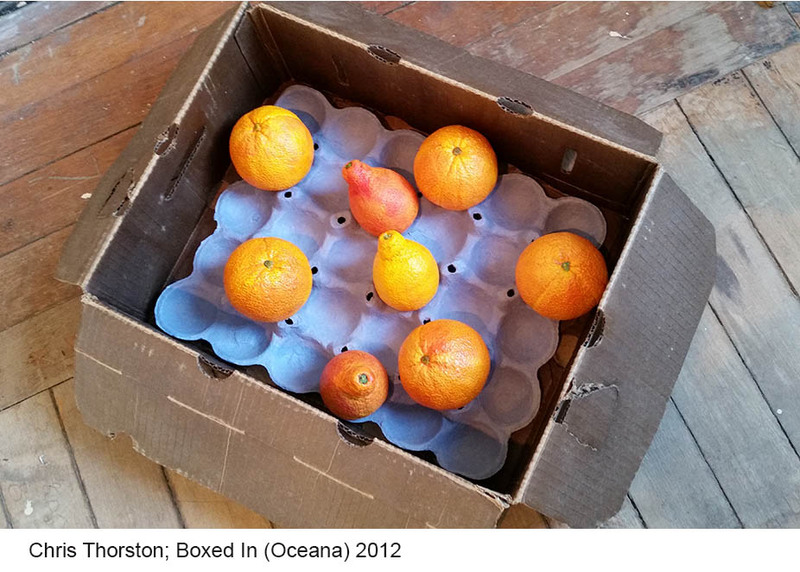 He displays these in found cardboard grocery boxes, bringing together the hand-made and found object. This in-between genre repeats in the carefully crafted silk boxing glove that Thorson displays as a found (or lost) object on the gallery windowsill. Victoria May also creates her-own objects from scratch. Relating to their ambiguous functionality, she builds on the gallery wall a fictional utility system from steel boxes connected by geometrically laid canvas cords. By constructing this pseudo-utilitarian system from old soft-looking materials, she exposes their frailty and diverts their functional authority, transforming them into an abstract composition. 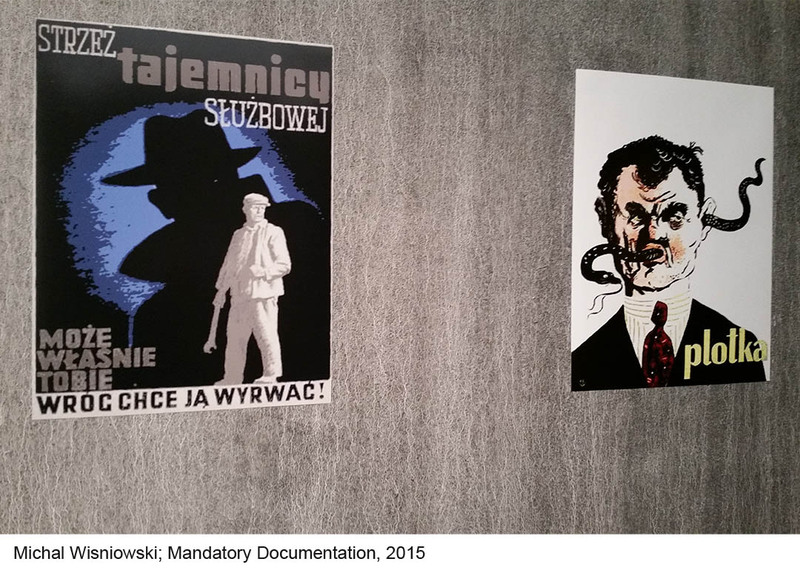 Another group of artists investigates the conceptual borderline between documentation and fiction. Michal Wisniowski creates a site-specific installation in which he displays a photo booth reminiscent of 1980s communist Poland, where he was born. He documents the era by carefully recreating a period room, which he turns into a nostalgic zone by inviting the audience to wear period cloths and photograph themselves with a vintage Polaroid camera. Tressa Pack, meanwhile, touches on the equivocal edge of documentation in her landscape photography. Her images contain a dichotomy of photographic witnessing of remote locations and fictional narratives that she creates by capturing scenes under partially illuminated or foggy conditions. These in-between temporary states allude to her interfering presence as a photographer while denoting the presence of an absent subject. Ritual is also investigated in the show, relating to ancient circular sites that shift our perception of materials and places. In her small installation, Allison Wiese transforms a set of wooden doorsteps into a ritualistic circle. This geometric accumulation changes small, unnoticed objects into a personal rite, reminiscent of the nature-based work of Richard Long. In a very different way, Bridget Batch creates her own ritual as she marks a small water area on the Owens Lake in the Sierra Nevada by a green glow etched into the air. This limited body of water was what remained of the lake after it water had been diverted to the Los Angeles aqueduct. In her performance, Batch creates a momentary mark. Captured by video, this transient effect turns magical cosmology into an environmental warning. The most dramatic borderline are the ones connected to memory and memorials, concentrating on our relationship to that which is absent. Mayumi Hamanaka’s manipulates photographs relate to collective memory. She bases her Invisible Land series on family photos found in Japanese towns after the 2011 Earthquake and Tsunami. She cuts the damaged parts out of these photographs. In their place she constructs layered topographies from white paper, alluding to the presence of lost lives and memories. Marshall Elliott creates an activated memorial, referring to roadside memorials for dead bikers. Elliott builds a mechanized installation of a perpetually circling rider-less bike. The empty white bike evokes the memory of the rider who is now missing. In another installation Elliot creates a three- dimensional momentum mori. He places a set of wooden chairs lying flipped on the floor and scatters saw dust on the floor next to them in the shape of their shadows. 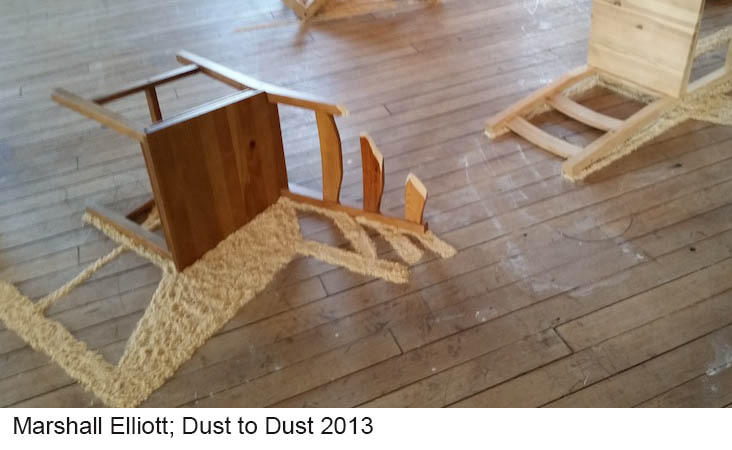 The grinded wooden remains evoke the absence of a light source, relating to the borderline between light and matter while connecting it to the biblical cycle of dust into dust and the line between life and death. This comprehensive exhibition surveys many aspects of the intangible borderline between definite states and definitions. Its strength is in the fact that while being rooted in concrete ideas, the art works stand out in their visual strength. The consistency of the simultaneous high quality of both aspects makes it hard to define the exact genre of this exhibition. This adds another layer of collective ambiguity and places the entire group display at the intangible borderline between genres.